Vintage Bride sells authentic vintage and antique wedding dresses, veils, jewellery and trousseau items for the "something old" part of your betrothal. We also offer custom designed new dresses reproduced from vintage patterns as well as the re-design and alteration of existing vintage dresses to bring them into the modern era. If you have your mom or grandmother's dress and would like to wear it on your wedding day but it is too small or you feel it is too modest for your tastes, perhaps re-designing it is an option. At a design consultation we will discuss how we can turn your family heirloom into your dream dress. 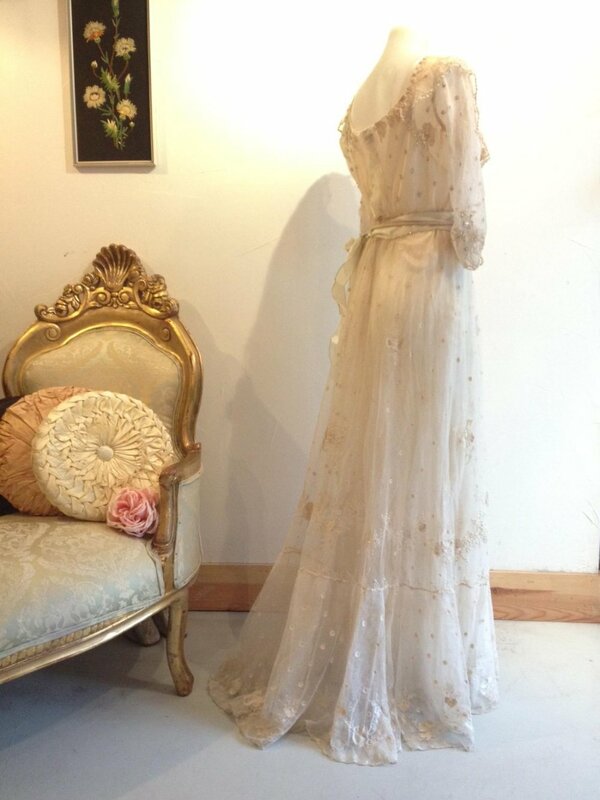 A cleaning and full restoration is included in all dresses purchased at Vintage Bride. We now are also pleased to offer cleaning and restoral services for heirloom vintage and antique dresses. This includes things such as: lace repair, stain removal and a cleaning and laundry treatment specifically tailored to the fabric content and style of each dress. Only in rare cases can nothing be done to restore a vintage dress to a wearable state. We also have a selection of dresses suitable for bridesmaids and mothers of the bride. When you come to Vintage Bride you will see and have the opportunity to try on unique dresses that represent the "ideal" dress to be wed in times throughout the twentieth century. All of the dresses in our collection are one of a kind to our store and as such may need alteration to fit their new owner. With the exception of some very small dresses with specific designs, alterations are always possible regardless of the size of the bride. Included in the cost of your vintage bridal gown is the cleaning and a full restoration. Since the dress is antique, it may have some age associated conditions that require repair. Such things as zipper or button replacement and lace reconstruction are included in the cost of your dress to bring it back to its original state. Likewise, the dress will be freshly cleaned for your special day. Dresses will be lighter in colour and a more vibrant tone after cleaning as years of fabric oxidation are lifted. If you fall in love with one of our dresses you can put it on hold for up to four days while you think about it and possibly return to the shop with members of your bridal party to assist you in making the big decision. After the four days, a 50% deposit is required to hold the dress further. This deposit is non refundable but is transferrable to another dress or bridal accessories. Yes, please. We are a small atelier and can only accommodate one bride at a time. If you come by unannounced we may not be able to take you should we not have other appointments or commitments at that time. Often a phone call can quickly resolve whether we have appointments available on short notice. Do I need to make an appointment even if I want to just look at vintage veils or jewellery ? Yes, it is still advisable to make an appointment. Especially if you are looking for something specific. That allows us more time to search the collection for you. What are the average prices of your gowns? The price of a vintage gown depends on mainly two things: quality and scarcity. Therefore, a silk gown with handmade lace from the 1920s (rare) will be more expensive than a polyester cocktail dress from the 1970s (common). That being said, the average price of our gowns is about $1250, with the range being from $700 to $4000. How long will it take to get my vintage wedding dress? When you purchase a dress from Vintage Bride it is one of a kind and you are buying the very dress you try on. If alterations are not required, it will usually take only a week in order to have your dress cleaned and fully restored for you ready to wear on your wedding day. Where do your dresses come from ? Rarely a day goes by without someone asking this question and the reality is there are many sources for our vintage gowns. Perhaps the most common is someone coming by with their dress, their mother's dress or their grandmother's dress etc., that has been kept for a long time yet no one within the family seems to want it. Rather than donate something so sentimental, the family wants to see it go to a "good home" somewhere else.